Hitch mounted bike rack, carries up to 4 bikes at a time. 2" receiver only. Our premium hitch rack combines security, convenience and revolutionary new cradles with Road Dampening Technology - making it the most complete hitch rack on the market. This new hitch rack’s unique arc design makes it easier to load and unload, provides better ground clearance and gives you greater distance between your bikes for easy transport. Swing-away feature makes for easy rear of vehicle access. One of the most popular hitch mounted 2 bike carriers. Available in 2,4 and 5 bike models. This 4 bike hitch mount Fits both 1 1/4" and 2" Receivers. 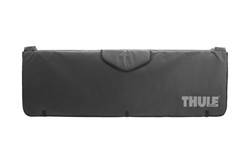 Sleek and durable Thule pad to maximize tailgate protection while carrying cargo. A premium clamp-style fork mounted carrier with versatile design that securely holds the fork blades of your bike. Carries up to 3 bikes, locks bikes carrier and carrier to car locks included. Similar to the Prologue, the Circuit fits a wider range of vehicles. Carrying up to 2 bikes, this premium rear mounted bike carrier provides the perfect fit for your vehicle for added protection and stability. Carrying up to 3 bikes, this premium rear mounted bike carrier provides the perfect fit for your vehicle for added protection and stability. Ultra-light aluminum hitch rack is nearly half the weight of a traditional carrier. Fits 2" and 1.25" receivers. 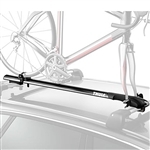 This robust rear mounted bike carrier features long dual arcing tubes providing greater clearance over rear spoilers and maximizing the amount of vehicles it can work with. 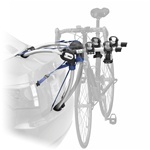 Maximum frame protection with this upright roof-mounted bike carrier as it makes contact with wheel only. 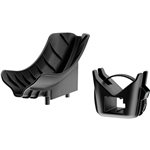 Rock-solid upright carrier with easy to use clamp design at a great value. Easily transport bikes without a standard top tube Telescoping bar adjusts to fit different frame styles Rubber-padded collars won't scratch your bike's finish.